July 3, 2017: The workshop took place in Washington, DC, USA. Congratulations to Balazs Gerofi and co-authors on receiving the best paper award! Post-workshop materials (slides, proceedings links, pictures) are available on the Program page. June 19, 2017: A preliminary workshop program has been posted. May 12, 2017: We accepted 7 out of 11 submissions (64% acceptance rate). April 8, 2017: The submission website is now closed. We have received 11 papers. March 27, 2017: The deadline has been extended to April 7, 2017. March 17, 2017: The keynote this year will be delivered by Dr. Arthur B. (Barney) Maccabe from Oak Ridge National Laboratory, USA. The complexity of node architectures in supercomputers increases as we cross petaflop milestones on the way towards Exascale. Increasing levels of parallelism in multi- and many-core chips and emerging heterogeneity of computational resources coupled with energy and memory constraints force a reevaluation of our approaches towards operating systems and runtime environments. 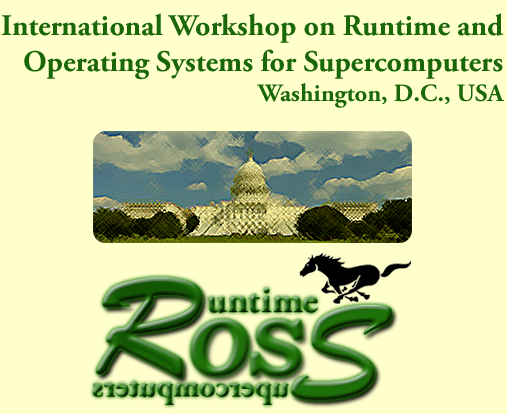 The International Workshop on Runtime and Operating Systems for Supercomputers provides a forum for researchers to exchange ideas and discuss research questions that are relevant to upcoming supercomputers. management of heterogeneous and reconfigurable compute resources, including FPGAs, GPUs, etc. Please see the submissions page for more information.